What could be , apparently , simpler than the screw propeller ? It seems that the man found in nature this form suitable for what he expected.. In fact, the history of propeller took a few centuries to reach this mysterious simplicity. That is, it is said, Archytas(-428/-360),disciple of Pythagoras, who "renews" the invention. 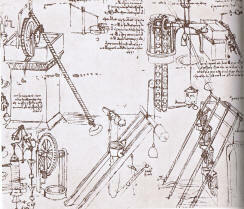 Which was used by Archimedes (-287/-212)for a different purpose: as a screw conveyor to ensure a horizontal mechanical translation of different objects. 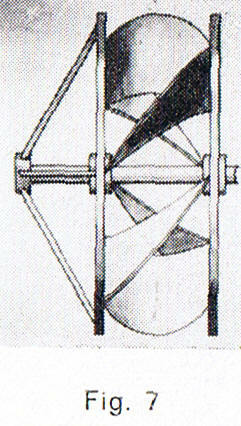 In this form, the "Archimedes screw" is still used in some plants for removing machining chips for example. ...We see that the Greeks of Alexandria knew the windmill. The Romans seem to have a very little used of it. Vitruve, Arch., lib. x, cap. v) and Varron (De re rustica, lib. I, cap. XLII) only talk about water mills. is with China, where only the vertical-axis machines were known, the birthplace of the aeroengine. It is only during the Middle Ages, that the windmills are emerging in Italy, France and Spain and Portugal. They are found, later, in Great Britain, Holland and Germany..Some authors suggest that their introduction in Europe is due to the Crusaders returning from the Middle East: "Knowledge of windmills came from the Crusades in the eleventh century.. Viollet Leduc (Dict. rais. d’arch., t. iv, p. 405) said they were called in Normandy,in the fourteenth century,Turkish mills, in remembrance of that origin ...." It is not impossible.The machines used here, the horizontal axis type, have four wings placed crosswise. They are mainly used to grind grain and especially wheat. Holland use them starting from 1350,for draining polders. 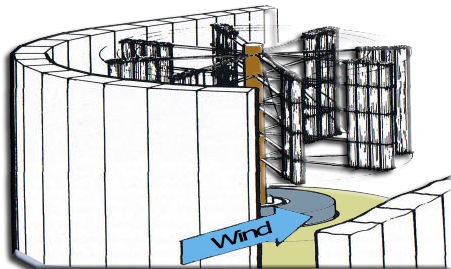 They are then coupled with the bucket wheel or Archimedes screws that can raise the water up to five meters. They are also used to extract oil from nuts and seeds,for sawing wood, turning rags into paper for the preparation of colored powders used in the composition of the dyes, and for the manufacture of snuff which replaced the cigarettes once. 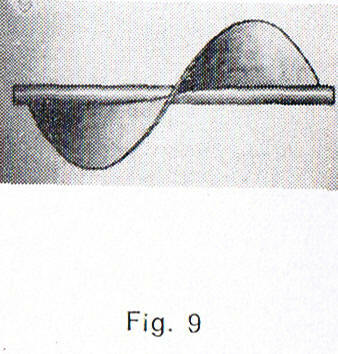 But this drawing (below) less known is instructive to use the propeller as recovery of the fluid energy. Here the stream of hot air rising through a column above a heat source, is transformed into mechanical energy. Some solar power projects use this process today.The shape of the propeller is incredibly modern here! 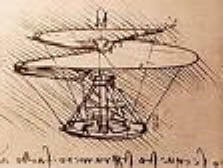 After Leonardo da Vinci, we find the English Hooke : in 1681,he proposed for marine propulsion, wings similar to those of windmills, boats at the time was only moved by paddle wheels.We find this same design with the mathematician Bernoulli in 1752. Proposal similar to the previous two by James Watt in 1784. But the time of the propeller was not yet come :power machinery mounted on boats, did not exceed a few dozen horses, and thus the impellers had not prohibitive size. 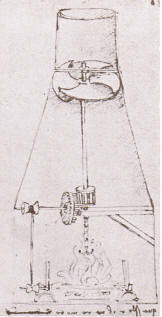 It seems that the "first use" of the propeller (as hydraulic motor used to power mills) dates back to 1699.It is due the French mechanic Duquet and the second use, identical to the first, is also due to a French, the mechanic Dubost in 1743.After Leonardo da Vinci, the French Paucton thought to apply to air propeller propulsion. 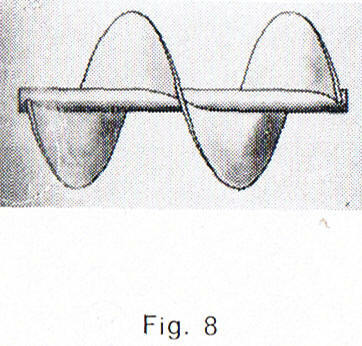 In his "Theory of the Archimedes screw," published in 1768, he describes a helicopter with two "ptérophores" (wings),one vertical axis to ensure the ascent, the other horizontal axis for movement and direction (at the time, issues of propulsion and steering were not yet separated). 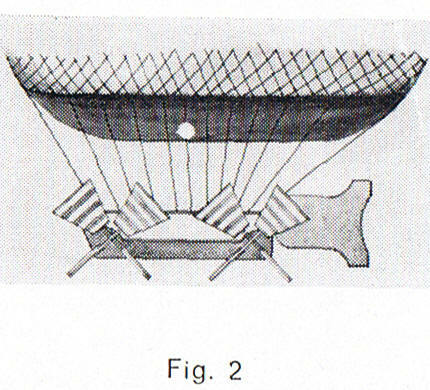 In 1784 he equipped a balloon without getting great result neither propulsion nor direction. From this application of the propeller in 1784 should not be inferred that the propeller was immediately adopted and that the following years were spent perfecting this propeller. 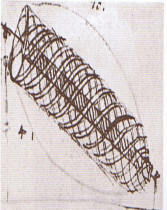 propeller "undulating surfaces" on the balloon to ~ Gontier-Grigny in 1860 (fig. 5). The same year as Blanchard (1784) two French, Launoy and Bienvenu,tried for their reduced model helicopter, the propellers "contra-rotating".. The propeller imposed fairly rapidly in ballooning, faster than in marine propulsion, we shall see.. And heavier than air knew no other propellant, from its origins to the reaction. However, the propeller of the aerostatic time, and the beginnings of aviation, had no current simplicity. They sometimes resemble the paddle wheel, or fan. How did we transform the Egyptian snail to the boat's propeller?. We left our "water screw" at the time of the experiences of French, Duquet and Dubost.. A few years later, in 1768, Paucton stated that the Archimedes screw could be applied to the propulsion of ships, but no realization ensued. Delisle (1823) (fig. 7) Bourdon (1824), Austrian Ressel (1826), Americans Cummerow (1829) and Smith (fig. 8), Woodcroft (1832), french Frédéric Sauvage (1832) (fig. 9). 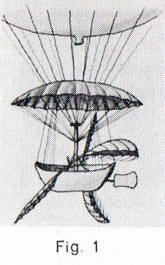 The contribution of Sauvage is crucial for two reasons : because the first, he proposed a propeller one turn and rather than a screw featuring a long shaft, subsequently because he made ​​several attempts, all successful.If they do not experience the development they deserve, it is only because the official authorities understood nothing of Sauvage experiences. It was necessary the Swedish engineer Ericson, realized a similar propeller, in 1836, for this engine is spreading in England and America. To finally be understood in France that the propeller of Sauvage was infinitely superior to the paddle wheels. France was going to make a further contribution to the marine propeller, the Augustin Normand. Frédéric Sauvage, considering that the system of paddle wheels to move the boat was bad, looking for another solution.He found it looking evolve a goldfish in its bowl. «This is the propellant he said. 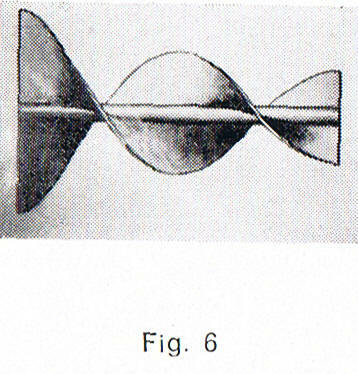 This is the sculling motion of the fish's tail, it constantly resting on the liquid; the sinuous movement is similar to that of the screw, which advances into the water. The same is true for the movement of the feet in the crawl, given the position they should have. But how mechanically translate the action of the fish's tail ? Sauvage, a cylindrical piece of wood. big as a pencil, draw a line in the form of geometric helix.. On that line and perpendicular to the cylinder axis, it crashes needles very close to each other. It gives the structure of a helical surface, it ends in sticky oiled canvas, on the needles. Such was his first propeller. Mounted on a boat model 27 inches long, it was a success.. It was powered by a counterweight system and pulley.. Sauvage then made a propeller copper-driven counterweight, and clockwork.Then he mounts two propellers turning side by side in opposite directions to balance the boat. An invention patent is granted May 28, 1932..
for several years up its propellers on boats, moved to arm men, unable to find the necessary support for the mounting on steamboats. The opportunity is offered to him in 1841 by a a boat builder from Havre, Augustin Normand. The two men approached. Then separate on one point: the fraction of pitch, which was opposed Sauvage. And this is where we find the contribution of Augustin Normand. This is a major breakthrough in terms of approach to the concept of screw propulsion, which passed the propeller stage screw, stage of thruster "reaction" to meet the principles of Newton(F=m.a)and Action-Reaction. It is from this revolution, accidental (In 1836, one of the first boats - an English vessel - to be equipped with propeller, broke that one. Here he is immobilized.. He tried come away with the portion of "screw" that remained and, curiously, it was discovered that his speed had increased.. The British remained in their astonishment, and deduced nothing of this fact.. But the French Augustin Normand, he was able to take in the event the capital conclusions) that result modern propeller and its method of calculation. Thrust (newtons) is the product of two factors:Thrust=mass(kg) X acceleration (m/sec²)(see newton:F=m.a).This is the change of momentum that generates thrust. The power required to produce this thrust is the product of two factors : power(watt)= thrust(newton) X velocity(m/sec). The output power observed in terms of displacement, which is useful to us: P.o=velocity upstream X thrust. 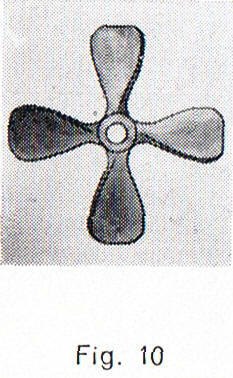 The kinetic power produced by the propeller. This power is calculated according to the variation of kinetic energy of the fluid. (kinetic energy = mass X 0.5 X speed ²). The vehicle being fixed, the velocity is zero, so the output power (P.out=velocity upstream X thrust) is zero. Yet the thrust of the propeller, and its power is real, the propeller rotates and is powered by an engine that consumes energy!It is therefore necessary to quantify, for this, the variation of kinetic energy, the propeller applies fluid is used.. Note that the energy consumed by the propeller when the vehicle is at a stop is wasted! "Good propeller", which makes money by transporting the goods, with a minimum of energy, it is a propeller that will give the maximum useful-energy, with minimal kinetic energy! Performance (quality) of our propeller is defines as the ratio: output power / kinetic power. It is essential to note that the power output is proportional to the speed variation, and the kinetic power is proportional to the square of the speed variation. This allows to highlight that the speed variation between the inlet and the outlet of the propeller, increases the kinetic power more than the power output. Must therefore achieve a propeller that produces the thrust, by changing as little as possible, the speed of the fuid..Thrust being the mass flow rate multiplied by the acceleration, it is preferable to increase the mass flow without increasing the speed. A flow is a velocity multiplied by a section,therefore to increase the mass flow without changing the speed,we need to increase the diameter of the propeller.. Conclusion: larger the propeller is, the less it will need to change the speed to create thrust, and the better its propulsive efficiency! This concept is today as it was worth a thousand years ago :it is necessary for high efficiency, High throughput, at the lowest possible speed. But it took thousands of years of meditation, to establish that the propeller form was that which most simply allowed to pushing back a large mass of fluid at low speed.